Request a quote for a bulk order for 6X His epitope tag monoclonal antibody - Classic. Please fill out the form here below. Your local sales account manager will get in touch with you shortly and send you a quotation based on your requirements. Monoclonal antibody raised in mouse against 6X His epitope tag, using a KLH-conjugated synthetic peptide. ELISA using the monoclonal 6xHIS Tag Antibody. Antigen: HIS-tagged purified protein and E. coli cell lysates expressing HIS-Tagged construct, GST- and FLAG-tagged purified proteins. Coating amount: 0.15ug per welll. 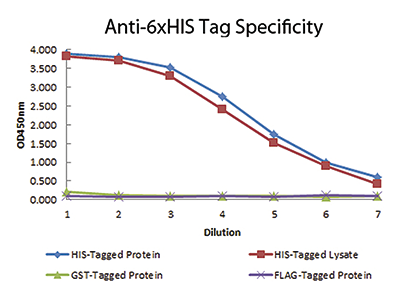 Primary antibody: 6xHIS Tag antibody at 100ug/mL. Dilution series: 2-fold. Mid-point concentration: 200ng/mL. 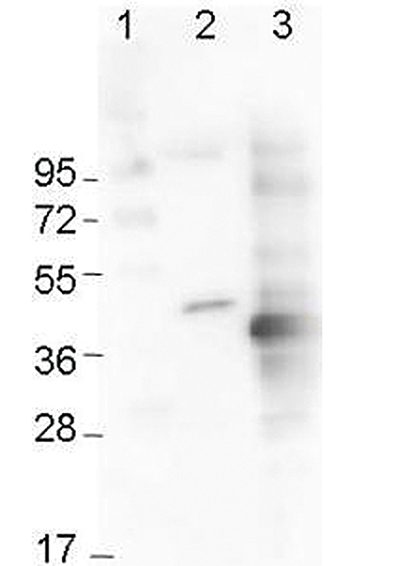 Secondary antibody: Peroxidase mouse secondary antibody at 1:10,000. 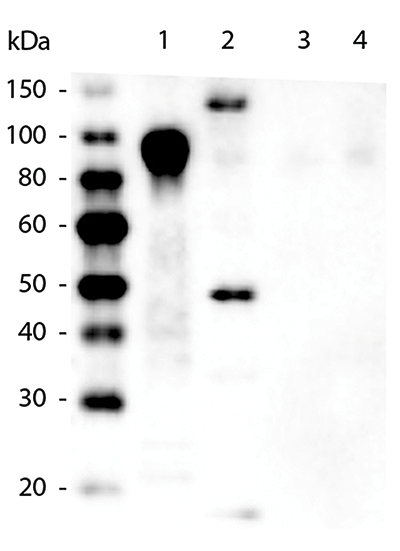 Western Blot of Mouse anti-6xHIS Tag Antibody. Lane 1: 100ng Purified histidine-tagged recombinant protein. Lane 2: 200ng E. coli cell lysate containing histidine-tagged expression construct. Lane 3: 100ng Purified GST-tagged recombinant protein. Lane 4: 100ng Purified FLAG-tagged recombinant protein. Primary antibody used at a 1:5,000 dilution overnight at 4°C. Secondary antibody: Peroxidase mouse secondary antibody at 1:20,000 for 30 min at RT. Western Blot using the monoclonal 6x-His Epitope Tag Antibody showing detection of the 6xHis sequence on N-terminally-tagged (lane 2) and C-terminally-tagged recombinant proteins (lane 3). A molecular weight marker is shown in lane 1. Diagenode strongly recommends using this:	6X His epitope tag monoclonal antibody - Classic (Diagenode Cat# C15200208 Lot# 001). Click here to copy to clipboard.